Tonight’s World Series game features two of the best pitchers in baseball, with Clayton Kershaw facing off against Chris Sale. Jayson Stark made the argument that it might be the greatest starting matchup of all-time based on the career WHIPs of the pitchers. Kershaw and Sale have amassed over 100 WAR combined, and the former is the older one at just 30 years of age. Kershaw is already a surefire Hall of Famer, while Sale is likely to finish in the top six of Cy Young voting for the seventh straight year. The first interesting finding from the numbers is that the appearance of even one ace in Game One of the World Series isn’t entirely common. Of the 142 pitchers who have started a Game One in the World Series since 1947, only 20 were coming off a six-win season. Chris Sale is having one of the better seasons of all-time for Game One starters. Probably didn’t think Kevin Brown was going to top this list, did you? After Brown, we have a run of four Hall of Famers, including some on the inner circle. As for Kershaw, his 3.5 WAR this season doesn’t really compare to marks produced by the pitchers above, but even without his great career and name value, a 3.5 WAR isn’t too bad when it comes to Game One starters, as the average and median are both 4.1 WAR. When you combine Kershaw and Sale, the matchup is pretty impressive. 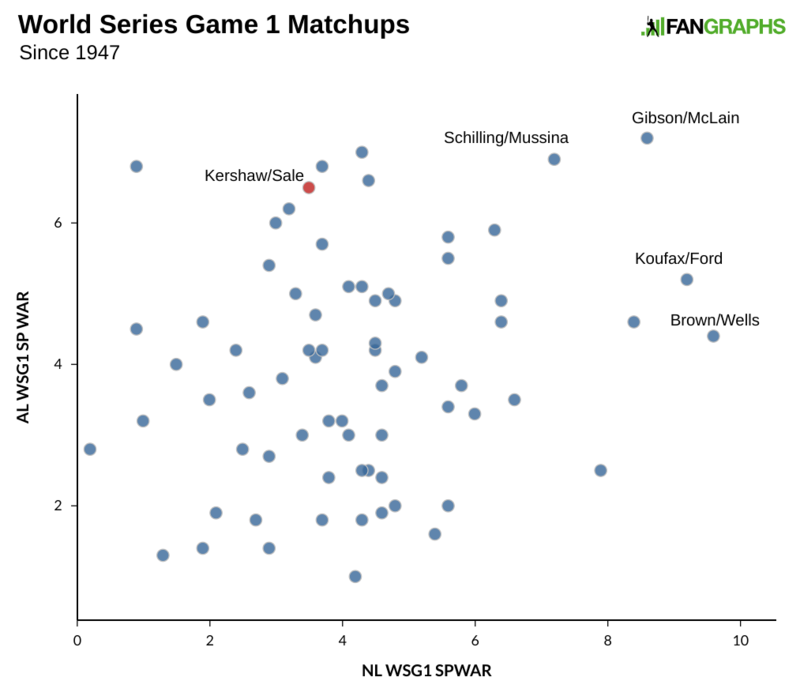 Below is a scatter plot showing every World Series opener since 1947 by starting pitcher WAR. As for the most impressive matchups, here are all of the World Series matchups since the strike in 1995 by geometric mean (so one pitcher can’t skew the average too much). That 2001 World Series proved to be a great one. What’s even more amazing about that first game is Curt Schilling wasn’t even his team’s best pitcher, as Randy Johnson paced the sport with 10.4 WAR that season. Meanwhile, Anthony Reyes had the lowest WAR of a Game One starter of the last 70 years. He and the Cardinals won the game over potential Hall of Famer Justin Verlander, then just 23 years old in his first full season in the majors. When we go back to 1947, that Schilling-Mussina matchup no longer holds the top position. It should come as no surprise that the Year of the Pitcher presented the best Game One matchup, but tonight’s game is pretty good, too. We hoped you liked reading The Best World Series Game One Matchups of All Time by Craig Edwards! 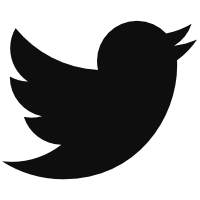 It would be interesting to zoom out and look at this over a longer time horizon. Kershaw had a down year (age, health, stuff, take your pick) and Sale’s WAR was somewhat depressed because of his DL stints, but both of these guys have been in the conversation for best pitcher in baseball since Sale become a full-time starter in 2012. Since then, Kershaw and Sale have combined for 84 fWAR (!) in 14 player-seasons, an average of 6 WAR/yr. They rank 1st and 3rd among pitchers in WAR over that time frame. 1st and 2nd among starters (min 900 IP) across ERA estimators (FIP/xFIP/SIERA), 2nd and 3rd by swinging strike rate…any way you cut it, they have been two of the very best. You could argue that tonight would have been an even more compelling matchup 2 or 3 years ago, and you’d probably be right. But even if neither guy is quite at their peak right now, they still represent the best that MLB has to offer on the mound over the past several years. Amazing to think with Kershaw and Sale- in this 7 year period where they’ve been so great- they have all of 2 Cy Youngs. Both have been pretty unlucky with a few years- Kershaw in 2015 to have Arrieta and Greinke be so incredible or last year- where if Kershaw has even another 10-15 innings he probably wins the award- and then Sale last year with Kluber having a historical 4 month stretch- or likely this year with his injury problems(after seeing him in September and October it definitely seems like they were legit and not Red Sox trying to just rest him).